Your hosts from the Unna Tjerusj Sami community invite you to sample some of their traditional hospitality. Learn about the reindeer herding and master some of the Arctic bush craft skills that the Sami people have passed from one generation to another. The life of a Sami evolves through eight seasons of the year by observing and harvesting from the nature. Close to the camp you will find an archaeological site with findings from Sami history, old fireplaces, signs of old Sami houses and pine tree bark harvesting . 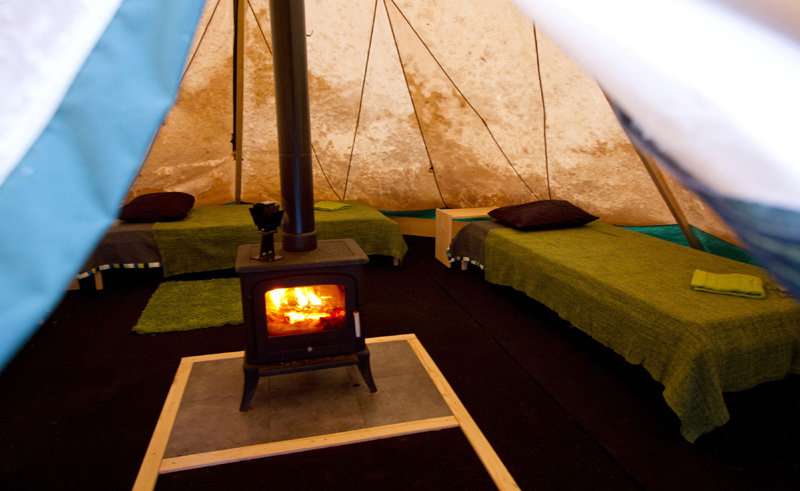 The camp has 5 wood heated lavvus that can accommodate 2 people in each with comfortable beds and a log burner to keep the tents comfortable. In a separate building you will find the cosy lounge with open fireplace, perfect for relaxing and enjoying the home-cooked meals prepared from local ingredients, such as reindeer, fish, berries and herbs. The toilet facilities are in another smaller cabin and there is a sauna hut on site. Full board is included throughout your stay. In addition to your own warm winter clothing, further outdoor will be provided for the colder days. Traditional wooden skis and snow shoes are available for you to use on the pre-prepared tracks around the camp.